Between Heaven and Hell is an assemblage consisting of shells, lace, wood, matchsticks, and other found objects, constructed to resemble a ship’s mast. 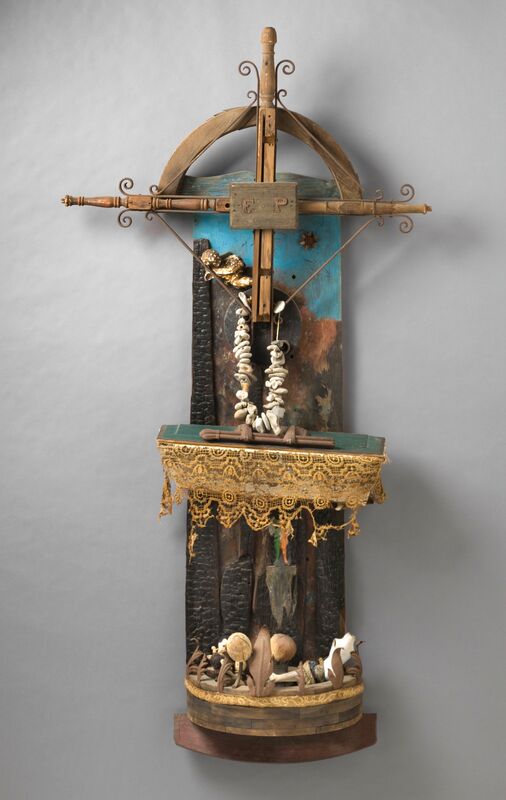 Wagner’s inspiration for working with assemblage comes from childhood, as the artist began beachcombing in the communities of Venice and Redondo Beach at the age of twelve. In 1966 he participated in 66 Signs of Neon, an exhibition organized by Noah Purifoy and Judson Powell in response to the Watts uprising, held at the Watts Towers Arts Center. Wagner was a mentor to George Herms and Betye Saar. "Between Heaven and Hell." Now Dig This! Art in Black Los Angeles, 1960–1980 Digital Archive. Los Angeles: Hammer Museum, 2016. https://hammer.ucla.edu/now-dig-this/art/between-heaven-and-hell.